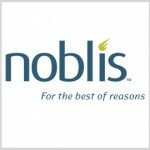 Noblis opened on Monday a new office that will house 118 employees in the Washington, D.C., area. The company said its new office is situated within L’Enfant Plaza and offers multiple work areas, laboratory spaces, conference rooms and other technology-equipped facilities. Mile Corrigan, vice president of federal civilian solutions at Noblis, said the office represents the firm's commitment to promote collaboration and productivity for employees and federal customers. The new location also supports Noblis' sustainability goals with compliance to Leadership in Energy and Environmental Design.